I knew today that summer was almost at an end when I saw the first new crop pears at the grocery store. It astonishes me how rapidly this one has sped past. I love autumn, but I’m not ready for it to be cold and for the days to get shorter. I have loved this summer’s late sunsets and balmy, languid twilights, which, in the Northwest, stretch on for hours. But today it finally felt like time to post this recipe, which I have kept in my back pocket for several months now. 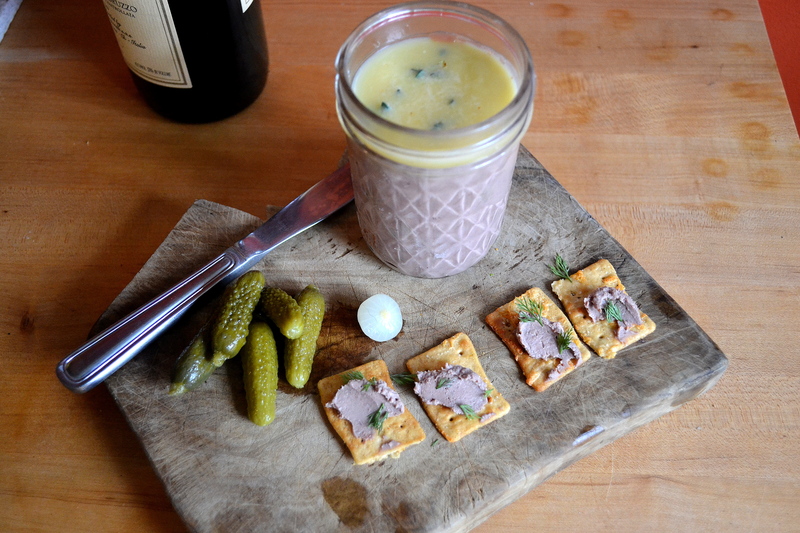 This is an old-school chicken liver mousse á la Julia Child. Far easier than a paté, this type of mousse can literally be whipped up in under twenty minutes, not including the time it needs to set (at least four hours in the fridge). It’s great when you’re cooking for a party and don’t want to fuss at the last minute. Chicken livers are not for everyone, although as a nice Jewish girl from New York, I confess an abiding fondness for them. But I find that this type of mousse is appealing even to finicky eaters. It has a delightful consistency, and the addition of pear adds delicacy and just a hint of sweetness. There are a couple of things to keep in mind should you attempt the recipe. First, be sure to use very fresh chicken livers that you have sourced carefully. I pay way too much for mine at a trendy local butcher, but it’s worth it. Second, when sautéing your chicken livers, don’t overcook them; they should retain a pink color within, as this keeps the consistency of the mousse tender and creamy and the flavor sweet. Third, don’t be afraid to let the pears caramelize in the butter. Finally, do take the added step of pushing the mousse through a chinois or fine-mesh sieve, as this way the mousse has a lovely mouth feel. 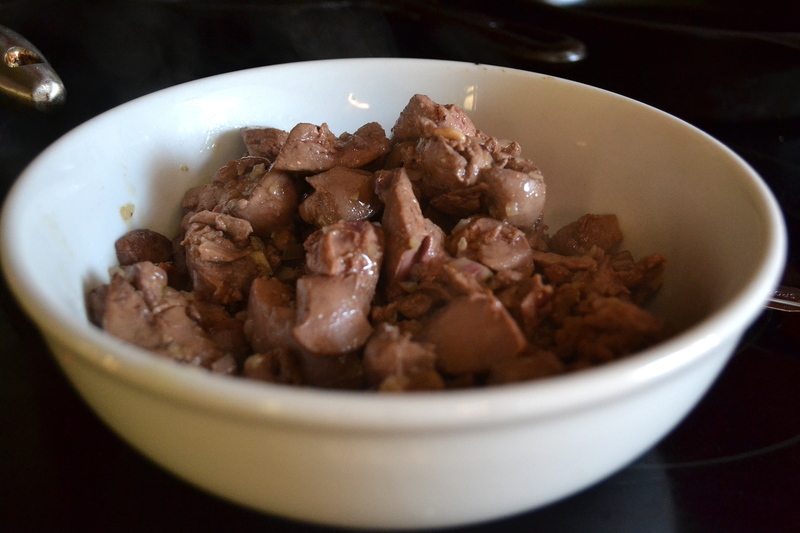 Rinse the chicken livers and trim off connective tissue, fatty bits, and black or discolored pieces with a sharp knife. (If you’re using fresh liver, the discoloration is just a function of oxidation, don’t be alarmed.) Slice the livers into evenly-sized chunks. Remove the livers into a reserved bowl and set aside. In the same pan, heat the remaining butter and add the diced pears. Cook over medium to medium-high heat, shaking the pan frequently, until the pears begin to caramelize and soften. When the pears have become pale gold, add the cognac and flame or reduce until the alcohol evaporates. Put the pears and reserved liver including any juices that may have escaped as they rested in your food processor or blender, add salt, pepper, and nutmeg, and pulse until puréed smooth. Taste and adjust seasonings as needed. Place your chinois or sieve over a bowl, scrape the puréed mixture into the sieve and, using a wooden spoon or rubber spatula, press the purée firmly through the sieve until nothing but solids remain, being sure to scrape off the goodness that has adhered to the other side of the sieve. Fold in the whipped cream until just mixed. Pour the mixture into the ramekins or jelly jars, cover, and put in your fridge to set for a minimum of four hours or overnight. Optional: after the mousse has set for a few hours and is no longer liquid, pour a little melted butter or aspic over the top, and garnish with a sprig or two of fresh herbs. Keep chilled until ready to serve, and consume within three days. Serve with crackers or bread and, if you wish, traditional accompaniments – cornichons, pickled onions, etc. Makes about 500 grams of mousse, or enough to fill two eight-ounce jelly jars with a little leftover for you. This entry was posted in Recipes, Starters, Uncategorized and tagged butter, Chicken liver, cognac, cooking with booze, Cream, French, Mousse, Pear, Photography, shallots by Susan. Bookmark the permalink. I’d be leery of using chicken meat instead of liver — part of what gives the mousse its fluffy texture is the delicate liver, so I have no idea how it would come out if you use meat — probably more like a paste than a mousse, I expect. Otherwise, experiment with seasonings as you like! Ooh! Please report back if you do! I love food experiments. This summer really has sped by — school (for a few kids I know anyways) starts next week. Hard to believe it’s almost fall, but I am excited about a few things: roasted chickens, hearty stews and now this. I love a good chicken liver mousse, especially when paired with fruit. And fall pears sound perfect! Wonderful! Do let me know what you think. This is one fabulous recipe! I’ve never included a fruit with my chicken liver pate, but I always serve some kind of fruit when I serve foie gras, so it makes total sense! Thank you! I can’t wait to try it! This is the kind of thing I would never eat — I am not a one for organ meats. I read the beginning of the post anyway, though, just to see what you have been up to. Cheers! 🙂 Thanks for commenting, even though you dislike offal. I have never acquired a taste for kidneys but do okay with most other offal. I’ve always loved chicken liver. When you mentioned a la Julia Child I instantly flashed back to the classic SNL skit with Dan Aykroyd as Ms Julia. PS Mike Easton has been busy over here, he just open an Roman-style pizzeria called Gabbiano and it’s a winner! Confession: when I think of Julia Child, most of the time the image that pops into my head is Dan Aykroyd. I need to check out Gabbiano; I hear great things. Mike Easton’s doing wonderful things with food in Seattle. Love your recipe – the tartness of liver and sweetness of pears must delicious. Where -i come from, we have a dish combining fried liver with apples. Also a true delight!